Gemini 12 (officially Gemini XII) was a 1966 manned spaceflight in NASA's Project Gemini. It was the 10th and final manned Gemini flight, the 18th manned American spaceflight, and the 26th spaceflight of all time, including X-15 flights over 100 kilometers (54 nmi). Commanded by Gemini VII veteran James A. Lovell, the flight featured three periods of extravehicular activity (EVA) by rookie Edwin "Buzz" Aldrin, lasting a total of 5 hours and 30 minutes. It also achieved the fifth rendezvous and fourth docking with an Agena target vehicle. 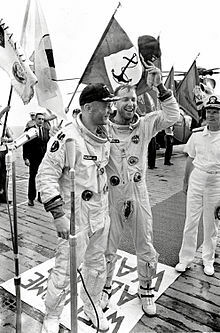 Gemini XII marked a successful conclusion of the Gemini program, achieving the last of its goals by successfully demonstrating that astronauts can effectively work outside of spacecraft. This was instrumental in paving the way for the Apollo program to achieve its goal of landing a man on the Moon by the end of the 1960s. Liftoff of the Atlas/Agena Target Vehicle occurred at 2:07:59 PM EST, and of the Gemini/Titan spacecraft at 3:46:33 PM EST, on November 11. All launch vehicle systems performed nominally during powered flight, but at staging there was a recurrence of the first stage oxidizer tank rupture first seen on Gemini 10's launch. On Gemini 12, the fuel tank appeared to have also ruptured as a white cloud was seen emitting from the spent stage along with the orange nitrogen tetroxide. Another episode of "Green Man" also occurred at SECO, referring to pitch gyrations caused by pressure buildup in the second stage protective skirt. 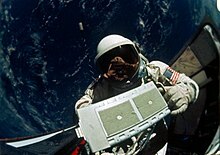 At the completion of the previous Gemini flight, the program still had not demonstrated that an astronaut could work easily and efficiently outside the spacecraft. In preparation for Gemini XII new, improved restraints were added to the outside of the capsule, and a new technique—underwater training—was introduced, which would become a staple of future space-walk simulation. Aldrin's two-hour, 20-minute tethered space-walk, during which he photographed star fields, retrieved a micrometeorite collector and did other chores, at last demonstrated the feasibility of extravehicular activity. Two more stand-up EVAs also went smoothly, as did the by-now routine rendezvous and docking with an Agena which was done "manually" using the onboard computer and charts when a rendezvous radar failed. The climb to a higher orbit, however, was canceled because of a problem with the Agena booster. During orbital injection, the GATV engine experienced a drop in turbopump speed lasting about 2.5 seconds. After this, pump performance returned to normal. Telemetry data indicated erratic pump speeds, but engine performance did not reflect this. Ground controllers decided not to risk the planned orbital boost maneuver since the exact reason for the pump slowdown was unclear. 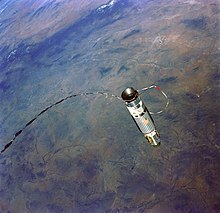 Following Gemini 12's reentry and during the GATV's 63rd orbit, they attempted to fire the propulsion system, but a stuck fuel valve prevented engine start from occurring. It was suspected that a turbopump bearing failure caused the anomalous conditions during orbital injection, followed by heating and melting of pump components. The inability of ground controllers to start the engine during the 63rd orbit was possibly due to melted or loose debris blocking the fuel valve and preventing its operation. The telemetry data falsely reporting erratic pump speed was concluded to be debris being knocked around and affecting the data probes. Many documentaries[example needed] afterward largely credit the spacewalk innovations, including the underwater training, to Aldrin himself. Gemini 12 was designed to perform rendezvous and docking with the Agena target vehicle, to conduct three extra-vehicular activity (EVA) operations, to conduct a tethered stationkeeping exercise, to perform docked maneuvers using the Agena propulsion system to change orbit, and demonstrate an automatic reentry. When Gemini 12 was being planned, one of the possibilities raised was the potential for the flight to be run in conjunction with the first Apollo mission, which had been tentatively scheduled for the last quarter of 1966. By May 1966, delays in making Apollo ready for flight just by itself, and the extra time needed to incorporate compatibility with the Gemini, made that impractical. This became moot when slippage in readiness of the Apollo spacecraft caused the last-quarter 1966 target date to be missed, and the Apollo mission was rescheduled for February 21, 1967. The 14 scientific experiments were (1) frog egg growth under zero-g, (2) synoptic terrain photography, (3) synoptic weather photography, (4) nuclear emulsions, (5) airglow horizon photography, (6) UV astronomical photography, and (7) dim sky photography. Two micrometeorite collection experiments, as well as three space phenomena photography experiments, were not fully completed. The capsule was controlled on reentry by computer and splashed down 4.8 kilometers from its target. The crew were taken aboard the aircraft carrier USS Wasp. The Gemini 12 mission was supported by the following U.S. Department of Defense resources; 9,775 personnel, 65 aircraft and 12 ships. Postflight medical examination disclosed no unusual conditions in either astronaut. Both were slightly exhausted and dehydrated due to problems with the spacecraft's water supply system forcing them to reduce their fluid intake on the last day of the mission and Lovell had a mild case of pinkeye. The patch's unique orange and black colors are a link to the flight's original scheduled date close to Halloween. The Roman numeral XII is located at the 12 o'clock position on the face of a clock, with the Gemini spacecraft pointing to it like the hour hand of a clock. This represents the position of Gemini 12 as the last flight of the Gemini program. With the Apollo project following this last flight of the Gemini program, the ultimate objective—the Moon—is symbolized by the crescent on the left. After several years at the Museum of Transport and Technology, in Auckland, New Zealand, the spacecraft was returned to the United States. It is now on display at the Adler Planetarium, Chicago, Illinois. Lovell and Aldrin were reunited with the spacecraft November 9, 2006 during the opening for Adler's "Shoot for the Moon" exhibit, almost 40 years after the mission launched. ^ a b c "Gemini XII" (PDF). Gemini Program Mission Report. NASA. 1967. Retrieved 2008-11-10. ^ "Friends and Rivals," When We Left Earth: The NASA Missions, Season 1 Ep. 2, Discovery Channel (2008). ^ "Apollo Shot May Come This Year". The Bonham Daily Favorite. Bonham, TX. United Press International. May 5, 1966. p. 1. Retrieved July 12, 2013. ^ Orloff, Richard W. (September 2004) [First published 2000]. "Apollo 1 - The Fire: 27 January 1967". Apollo by the Numbers: A Statistical Reference. NASA History Division, Office of Policy and Plans. NASA History Series. 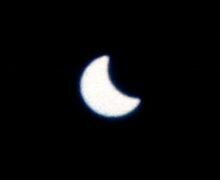 Washington, D.C.: NASA. ISBN 0-16-050631-X. LCCN 00061677. NASA SP-2000-4029. Retrieved July 12, 2013. 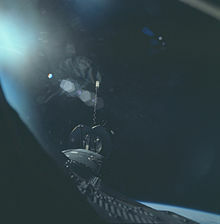 Wikimedia Commons has media related to Gemini 12. 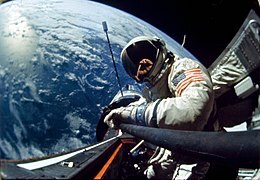 "Gemini 12 photographs". University of Missouri–St. Louis. This page was last edited on 6 April 2019, at 22:26 (UTC).